The Senate confirmed a new military commander for troops in the Middle East yesterday, backing Navy Adm. William Fallon to replace Army Gen. John Abizaid as head of U.S. Central Command. City Council members hinted that Mayor Mufi Hannemann's plan to elevate Oahu Civil Defense Agency to a Cabinet-level department could be killed when it comes up for a final vote Feb. 21. Councilmembers said they did not get satisfactory answers on why the change is needed and the differences between the old agency and the proposed new one. "There's a whole department being created, and there's no plan," Committee Chairwoman Ann Kobayashi said. Along with the new department, the Hannemann administration plans to ask the City Council for about $140,000 more in the agency's budget and four more positions with at least one of the posts paid for by federal funding. The Council's Executive Matters Committee, made up of all nine councilmembers, had passed the measure approving the change and the creation of the new Department of Emergency Management. The change would become effective upon approval by the Council or if the Council takes no action at its Feb. 21 meeting. The plan would die only if at least six of the nine councilmembers reject it at the next meeting, action that was nearly recommended by the committee. A segment of Kailua Road will be closed in one direction for several weeks and in both directions for several days this month to complete sewer work near Kailua Beach, city officials said yesterday. Beginning as soon as next week, contractors will be connecting existing sewer lines to the recently completed Kalaheo Avenue sewer line, the city said in a release. For most of the several-week project, one direction of traffic on Kailua Road between South Kalaheo Avenue and Aumoe Road will be closed and the other direction rerouted. Detours will be marked and police will direct traffic during work hours of 8:30 a.m. to 6 p.m. Monday to Saturday. For a few days when Kailua Road is closed between South Kalaheo Avenue and Aumoe Road, all traffic to and from Lanikai and Kailua Beach will have to use South Kalaheo, the city said. For more information, visit www.kalaheosewer.com or call 386-0163. Hawaii Democratic Party Chairman Mike McCartney promised that party politics will not come into play if he is confirmed to a seat on the Police Commission. "I'll be fair, objective, open and honest -- that's a position on the Police Commission that I'll take seriously," McCartney said yesterday after the City Council's Executive Matters Committee approved his nomination. 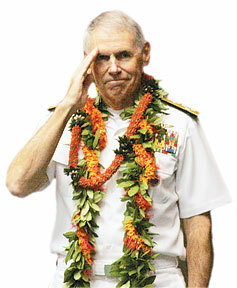 McCartney is being tapped by Mayor Mufi Hannemann to serve out the remaining term of departing Commissioner Caroll Takahashi, a term that ends Dec. 31. An e-mail sent to the Council questioned whether McCartney could be fair and unbiased in his commission dealings with Police Chief Boisse Correa, who has relatives well connected in the party. The commission's duties include hiring, firing and evaluating the police chief. "Everyone will be treated fairly regardless of their party affiliation," said McCartney, whose term as party chairman ends May 2008. McCartney is scheduled for a confirmation vote by the Council on Feb. 21. Volunteers are being sought for a work project Saturday at Ulupo Heiau, on the edge of Kailua's Kawainui Marsh. Ahahui Malama i ka Lokahi and the Kailua Hawaiian Civic Club, co-curators of the heiau, will lead a work crew picking up tree branches blown down by high winds last week. To volunteer, contact Malia Bird Helela at 589-2963 or hemanumalia@hotmail.com. Keith Miser, vice chancellor for student affairs at the University of Hawaii-Hilo, is the recipient of the national 2007 Scott Goodnight Award for Outstanding Service as a Dean. Miser was commended for his zeal and compassion in helping underserved and disadvantaged students. Kyle Monette of Mililani High School, an advocate for juvenile diabetes research, was one of 10 in the nation to win the Lewis Hine Award. He developed the "Shoes in the Chute" fundraiser in which he bought inexpensive sneakers from online vendors and enlisted students to sell them to raise funds for the Juvenile Diabetes Research Fund. He collected $50,000 in three years. St. Francis Healthcare System of Hawaii named five recipients of the 2006 Mother Marianne (Cope) Awards. They include: Patrick Kelly, a crisis nurse in the Critical Care Unit, and an educator to nurses; Karen Norwood, central supply services/Operating Room manager, and employee for 26 years; Felicia Marquez-Wong, bereavement coordinator for the past 12 years; Sharon Sato, finance administrative coordinator, and an employee for 33 years; Jorge Camara, an ophthalmologist and former chief of the Eye, Ear, Nose & Throat department, an employee for 19 years. Moiliili Community Center elected the following officers for 2007: president, Grant Kagimoto, Cane Haul Road owner; first vice president, Joni Young, Costco Wholesale; second vice president, Reese Nakamura, state Deputy Attorney General; secretary, Julie Ebato, Criminal Justice Planning Specialist, Department of the Attorney General; and treasurer, Cynthia Manabe, Realtor, Property Profiles. An 84-year-old woman was in a crosswalk yesterday when she was struck by a vehicle and seriously injured on Kamehameha Highway in Kahuku. Police dispatch received a call about the accident at 11:52 a.m.
Police arrested a 40-year-old man for allegedly threatening a household member with a handgun. Police said the suspect was arguing with a 40-year-old woman at about 9:30 p.m. Tuesday in Nanakuli. Police said the two began fighting, and the suspect choked her and threatened her with a handgun. The man was arrested for investigation of first-degree terroristic threatening, a firearm violation and abuse of a household member. Police arrested a 37-year-old man who was allegedly caught stealing aluminum wiring from a light pole on the Pearl City onramp to the Waianae-bound lanes of the H-1 freeway. Police said that at about 9:55 p.m. Tuesday, a witness reported seeing the man tampering with a box attached to the pole. Officers arrived and found cut pieces of wire in the suspect's truck, police said. Police arrested the man for investigation of second-degree theft. A 46-year-old man with 80 prior arrests was arrested Tuesday for allegedly stealing from a store. At about 3:10 p.m. the suspect was seen concealing items in a Pearlridge retail store and was confronted by store security, police said. The suspect allegedly assaulted the security officer but was subdued after a struggle, police said. The suspect was arrested on suspicion of second-degree robbery and was on probation for a previous felony conviction, police said. A woman found in the trunk of a car was arrested for allegedly stealing that car. Police said that at about noon Monday, officers found a 39-year-old woman in the trunk of a car in Waipahu. Officers checked the license plate and learned the car was stolen Friday from a rental company. Two witnesses identified the woman as the driver, police said. Officers then arrested her for investigation of auto theft. Police did not explain why she was in the trunk. Police arrested a 20-year-old woman last night for allegedly harassing an officer over a parking ticket. Police said that at about 11 p.m. the woman confronted a patrol officer on Aloha Drive in Waikiki and demanded to know why he had ticketed her car earlier in the evening. As the officer requested her driver's license, she allegedly attempted to steal his equipment. The officer then tried to arrest her and she resisted and spit at him, police said. She was then arrested on suspicion of attempted theft, harassment and resisting arrest. Police arrested a 26-year-old man after he allegedly attacked two men with a slingshot. All three were friends who were arguing at about 8:30 p.m. Monday in Kalihi, police said. The argument escalated and the suspect used the slingshot on his friends, ages 25 and 36, police said. Police arrested the suspect yesterday for investigation of second-degree assault.